Artists: You have everything you need. So, there I was, tired and in good company, feeling pretty creatively dry, not expecting much from the evening. 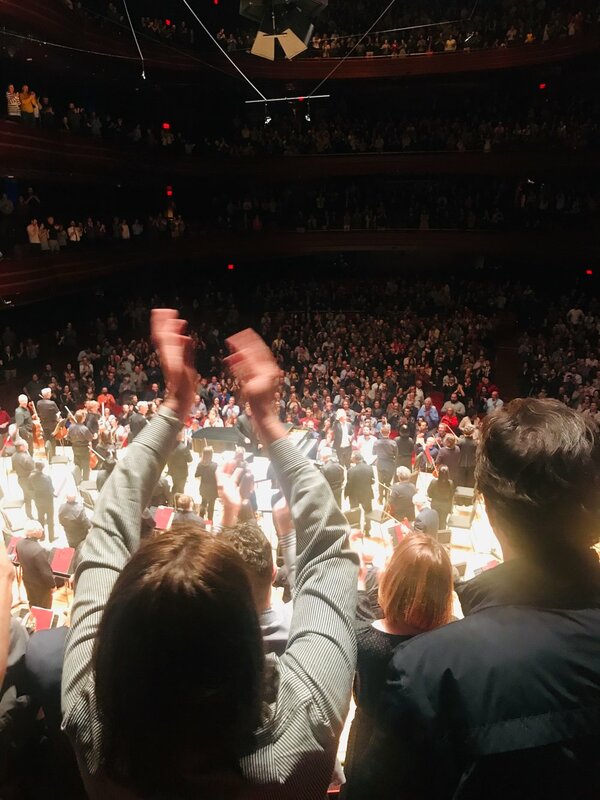 Yet, it was the encore that left me floating out of the Kimmel Center with renewed inspiration and hope. I still struggle with burn out and periods of creative drought, and sometimes when I’m desperate, I look to the Bible for help. Full disclosure: sometimes I use God’s word like a Magic 8 Ball. I’ve been known to ask a question of God, flip to a random page and verse in hopes of receiving a sort of “telegram” from the Almighty. As you can imagine, this rarely works, and (let’s be honest) is often pretty comical. But, lately, I’ve been wanting to talk to God about: my creativity, about my worry that burn out and general fatigue as a working classical musician is destroying my creative impulse, and that it’s made me forget what I loved about making music in the first place. I wanted proof that this creative work we do is valid and, most of all, I wanted to confirm my suspicion (and my hope) that this “spirit” I feel collaborating with me when things are going well, is the Spirit of God. Remembering that God is within my work as an oboist—well, that just might motivate me to keep going when things are hard. Although the Bible isn’t a Magic 8 Ball or a fortune teller, it is something better. I came across this passage from Exodus, where we see God equipping God’s people with all the skills they need to build the Tabernacle. Moses relayed the information that they were going to create an amazing house for the Lord to dwell within, and certain artisans would be working in stone, metals, embroidery, etc. to make this happen. They were going to make something incredible, and it wouldn’t be Moses who would do it alone. I wonder if the Israelite artists had a crisis of confidence in this moment. Until recently, they had spent their time and skill making bricks as Egyptian slaves. Maybe their creative impulse was broken too. And now God was asking them to come back out on stage (one night only!) to make something truly beautiful, not just a utilitarian carrying case for the Torah, but an extravagant work of art in honor of the One who had released them from their captivity, a place that God would inhabit God’s self. And they needn’t worry, each of them would be filled with the Spirit—with wisdom, understanding, knowledge, and skill—to do all they were called to, however impossible it seemed at the time. Speaking of impossible feats of artistry, Ben Folds has a history of writing songs on stage. (This is a classical musician’s nightmare!) As an encore last night, he composed a brand-new song in collaboration with the orchestra, right in front of the audience’s eyes. He started with a riff for the basses. Playing it once or twice on the piano, the bass section caught on right away (after all, this is the Philly Orchestra.) Next, he added two violin parts, the concert master executing it perfectly on the first try and effortlessly passing it back to the rest of the violin stands. On he went from section to section, until every person had a part. It took a total of five minutes. Like most pop songs, it was very simple, but what moved me was the energy that began to permeate the space during this process. I was seated with friends behind the orchestra and as I watched the players’ eyes closely, I saw a kind of awakening I hadn’t seen in the show yet. They smiled and playfully approached this endeavor with such a contagious joy. This joy, like the music they were making, palpably filled the entire hall, rising like incense all the way to the highest balcony. They created something more beautiful and real than anything Ben Folds could have ever done alone. As my friends and I walked into the cold night, I got to thinking about how we become so obsessed with all that we don’t know as artists, that we forget that everything we need to begin is already within us. As a gift from God, God’s Spirit seeks to encourage our gifts and to collaborate with us! The tricky part comes next, when we realize this does not mean we don’t need to continue honing our craft. Yet, it means we can do so from a place of confidence and playfulness as beloved children of God, believing that those whom God calls, God equips. Everything we need has already been given to us. If we are open to it, the Spirit will find us at our writing desk, painting studio, or even the Kimmel Center, when we are willing to accept the invitation and show up.